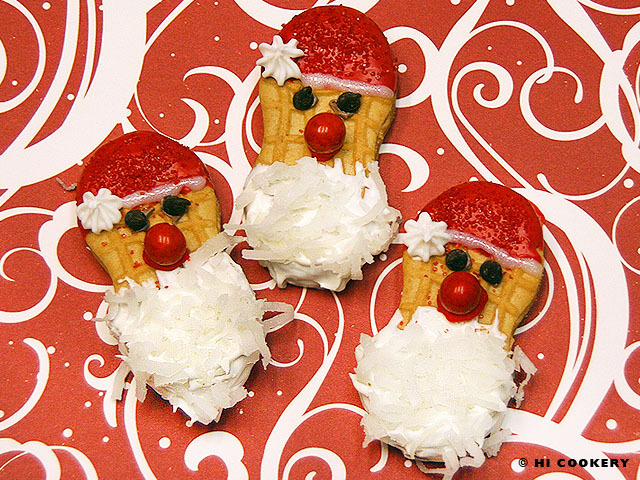 Islander participates in some cookie exchanges during this time of the year. She enjoys getting new ideas and potential blog recipes at these unique holiday gatherings. One cute cookie that caught her eye was the Santa Claus creation made out of peanut butter sandwich cookies, melted white chocolate, red candies and coconut flakes. Although they are a little time consuming to assemble, they are a fun project to do with the help from little elves/kids! Make St. Nick Nutter Butters for Christmas cookie exchanges, seasonal parties and especially for the Feast Day of St. Nicholas. Line a cookie sheet with wax paper. 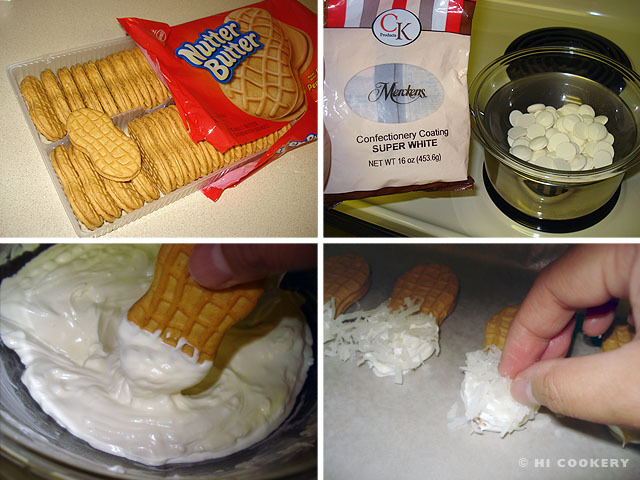 Melt the white chocolate according to the package directions (microwave or double boiler). Dip one end of the Nutter Butter cookie into the melted white chocolate. Lay on the prepared cookie sheet. Before the chocolate hardens, sprinkle some coconut flakes to make the beard. Continue dipping the rest of the cookies and making the beards. Allow the chocolate to cool and harden. Melt the red candy according to the package directions (microwave or double boiler). Dip the other end of the Nutter Butter cookie into the melted red candy, being careful not to get coconut flakes into the dipping bowl. Lay on the prepared cookie sheet. Before the candy hardens, sprinkle some red sugar to give texture to the hat (optional). Continue dipping the rest of the cookies and making the hats. Allow the candy to cool and harden. 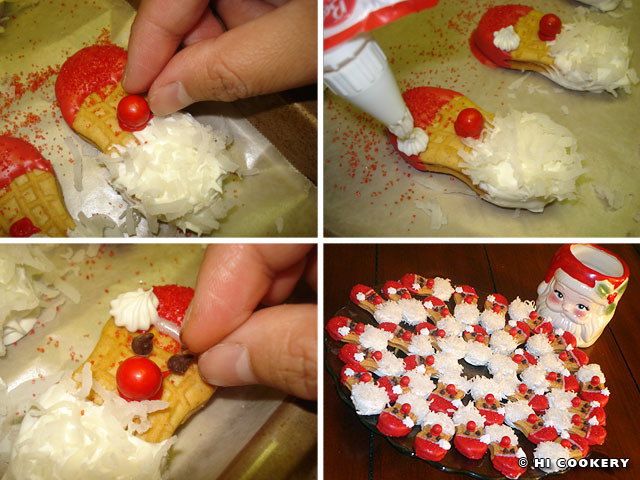 Use red frosting to adhere a red round candy as the nose. Use a star tip on the white tube frosting to add the “snowball” and a small round tip to draw the white fur detail on the hat. Use a little bit of frosting to adhere the mini chocolate chips for the eyes. Allow the frosting to set before arranging the finished cookies on a decorative platter. 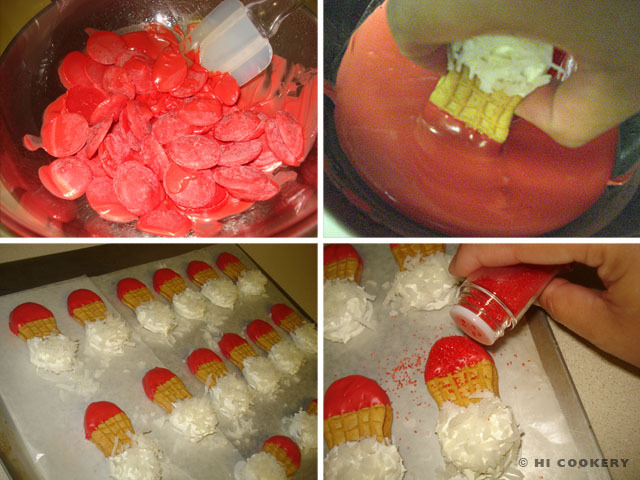 A variation in the process of making the Santa hat is by dipping the other end of the Nutter Butter cookie in white instead of red candy melts and sprinkling the red sugar crystals halfway on top of it to have the white fur border. Others attach a mini-marshmallow or white chocolate chip for the Santa hat “snowball” instead of using white frosting and a star tip. Try the traditional St. Nikolaas Koekjes recipe for the Feast Day of St. Nicholas. Search our blog for other Santa Claus/St. Nicholas and Christmas-inspired recipes.